Our new line of barn lights are sure to brighten up your stable. Made from precision spun aluminum and powder coated with the same process we use at Classic. 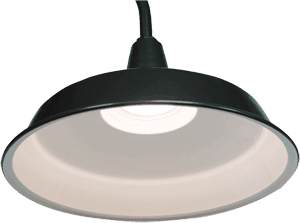 Comes standard with white interior providing a minimum 85% reflectance. Turned in bottom bead is unique and adds strength while preventing the collection of dust and water. 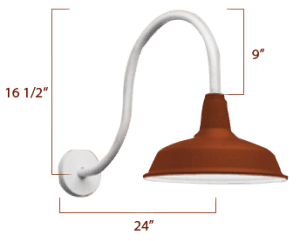 Standard incandescent lamp holders are heavy-duty porcelain with spring loaded center contact and lamp gripscrew shell. 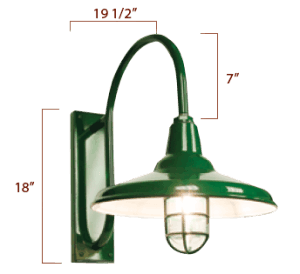 Standard – Max 300W Shallow – Max 200W Design the perfect barn light in four simple steps: Choose a shade, mounting style, globe and color. Other options available upon request. The most basic mounting option – includes 10’ #18 3 conductor cord. Select from 24”, 36” or 48” stems. Canopy is self-aligning for mount on angled or level ceilings. None, bulb only. NOT INCLUDED. Clear Lexan Jelly Jar; no guard required.